Sometimes the horizon is defined by a wall behind which rises the noise of a disappearing train. The whole nostalgia of the infinite is revealed to us behind the geometrical precision of the square. We experience the most unforgettable movements when certain aspects of the world, whose existence we completely ignore, suddenly confront us with the revelation of mysteries lying all the time within our reach and which we cannot see because we are too short-sighted, and cannot feel because our senses are inadequately developed. Their dead voices speak to us from nearby, but they sound like voices from another planet. 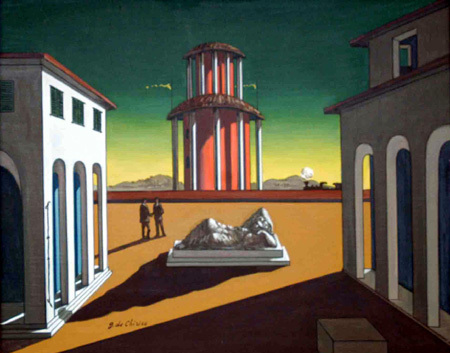 A turning point for me when I was first stumbling around with my own painting was when I encountered the work of Giorgio de Chirico, an Italian painter of darkly toned metaphorical works. He lived from 1888 until 1978 but was primarily known for his early work from 1909-1919 which is called his Metaphysical Period. Metaphysics is devoted to the exploration of what is behind visible reality without relying on measurable data. Very mystical. 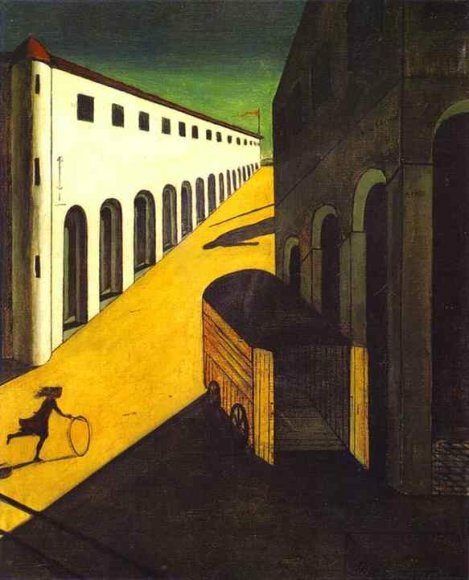 De Chirico’s work after 1919 became more realistic and more traditional. His later work was less colorful, less symbolic, less powerful and way more mundane. It is definitely the work from the earlier Metaphysical period that defines him as the artist as we know him today. I was immediately drawn to that work. It was full of high contrast, with sharp light and dark. The colors were bold, bright and vibrant, yet there was darkness implied in them. The compositions were full of interesting juxtapositions of forms and perspectives. It was a visual feast for me. At that time in my own painting, I was still painting in a fairly traditional manner, especially with watercolors. That is to say that I was achieving light through the transparency of my paint, letting the underlying paper show through. It was pretty clean which was fine. But it wasn’t what I was looking for in my work. Seeing de Chirico’s paintings made me realize what I wanted. It was that underlying darkness that his work possessed. It was a grittiness, a dark dose of the reality of our existence. I immediately began to experiment with different methods that would introduce a base of darkness that the light and color could play off. My work began to change in short order and strides forward came much quicker as a result of simply sensing something in de Chirico’s work that wasn’t there in my own. This post is a combination of a couple of posts from years ago. I really wanted to use his quote at the top because I often get that feeling from certain paintings, that they represent “voices from another planet,” that they come from a point well beyond our realm of knowledge. 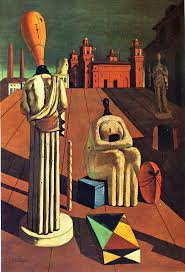 I also wanted to include the video below that shows much of De Chirico’s metaphysical work. Take a look below. 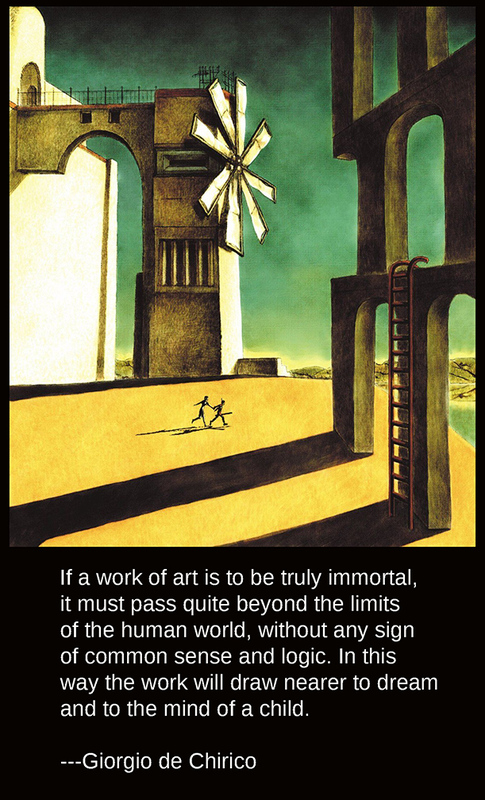 I like this quote from de Chirico. We are surrounded by mystery wonder at every turn yet we don’t even notice. I especially love the last line — Their dead voices speak to us from nearby, but they sound like voices from another planet. It has such a poetic rhythm and reminds me of stepping out from my studio and looking up into the night sky to see Jupiter shining so brightly above me, so huge and visible to us yet mostly unnoticed. Voices from another planet. 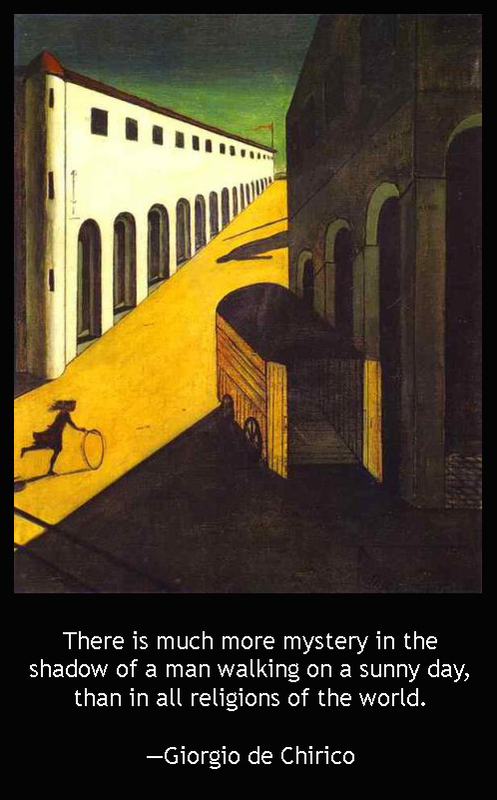 De Chirico was an interesting case. His earlier work, from his metaphysical period like the pieces shown here, is the work that defines him. Definitely the work that influenced me and a host of other artists. It is work with a distinct and powerful voice, wok that you immediately recognize as his alone. But in mid-career he basically set it aside and began to paint in a more traditional manner. It was good work but was not distinctive and set apart from other artists. It was work that could have been painted by any number of professional painters and lacked both the individual voice and the revelation of mystery that seemed ingrained in the early work. This later work never garnered nearly the attention that his earlier work had, much to de Chirico’s consternation. I can’t say that de Chirico was wrong for following his mind in changing his style. It was his to change. But there is a lesson here in that your individual voice is the greatest asset that any person can possess– if you dare to stand apart and pay heed to those voices from another planet.